BOULDER,Colo. - NASA?s Kepler space telescope, asharp-eyed spacecraft designed to hunt for Earth-like planets, is ready to shipout for an early March launch. BallAerospace & Technologies Corp. - the Boulder, Colo.-based NASA contractorresponsible for developing the Kepler flight system and supporting missionoperations - recently completed the spacecraft?s final pre-ship checkout and delivered the spacecraft to CapeCanaveral Air Force Station, Fla., for a March 5 liftoff on a Delta2 booster. ?In orderto find Earth-sized planets, you need to stare at the same place in space andlook for dips in the light curve,? said John Troeltzsch, Ball Aerospace program manager for civil space systems. Kepler initially will look at 140,000 stars, with projectscientists paring the field of study down to 100,000 stars, Troeltzsch said. Building the NASA Discovery-classKepler has meant harnessing a trio of key capabilities: pointing accuracy, a very large field of view andlow-noise electronics to maximize the ability to read data from the sensitivedetection system. ?It?s avery sophisticated machine,? Troeltzsch told Space News in a Dec.?16 interview. The technology toundertake Kepler was not?available until just a few yearsago, he said, ?so we really are at the right place at the right time.? Part ofthat opportune timing has been?the increasing number ofextrasolar planets detected to date, ?most of which have been?at least the size of Jupiter. Over its three and a half year mission, Kepler will attempt to detect planets 30 to 600 timessmaller than Jupiter. Given that Earth-sized worlds do exist around stars like?the sun, Kepler is expected to be thefirst to find them, and the first to measure their frequency. Locatingrocky worlds like Earth, including those that lie in a star?s habitablezone, could mean identifying planets where liquid water, and perhaps life,could exist. Using a0.95-meter diameter telescope and an array of 42 charge-coupled devices - thelight-sensitive microchips at the heart of the most common digital cameras - ?Kepler will measure the change in brightnessthat occurs when a planet transits?across the face of its parent star.From that light fluctuation in starlight - and time between transits -scientists can determine the size of the planet, the size of the planet?s orbit, andeven approximate the planet?s temperature. ?What we?reinterested in are light curves over time,? Troeltzsch said. ?There are nopretty pictures? like Hubble Space Telescope images or Spitzer Space Telescopeinfrared observations, he said, but Kepler is perfectly optimized for itssearch duties. ?I grew upwatching ?Star Trek,? so I?m confident that there are a lotof planets out there,? Troeltzsch said. ?If we get no result, that?s going tobe just as profound.? Followinglaunch, Kepler will?be nudged into an Earth-trailingheliocentric orbit with a period of 372.5 days. Once on duty and collectingdata, the spacecraft rolls every 30 days to align a fixed high-gain antenna todownload that month?s gathered readings to NASA?s Deep Space Network. Kepleralso carries out a 90-degree roll every 90 days to keep its solar panels alwayspointed at the sun, Troeltzsch noted. Kepler datais to be relayed to the Data Management Center at the Space Telescope ScienceInstitute in Baltimore, with science data analysis carriedout by the NASA Ames Research Center at Moffett Field, Calif. 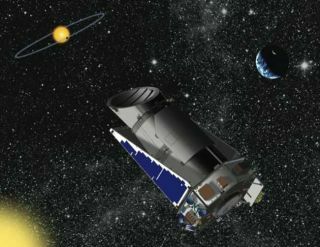 The searchfor exo-planets in the last decade has escalated from something hardly conceivable to an active and enthusiastic scientificendeavor, said Bill Borucki, the scienceprincipal investigator for the Kepler Mission at NASA Ames. Kepler hastaken a long road to reach the launch pad. Using thetransit technique for spotting Earth-sized planets by a spacecraft was firstsuggested by Borucki in 1984. ?I pursuedthis for 14 years ? I did get an award for being persistent,? Borucki said,recalling the critics who told?him what he was proposing would never work. But time, technology and perseverance?eventually won out, he said, with Kepler gaining flight approvalas a NASA Discovery mission in late 2001. However, the price tag for theDiscovery-class mission has?risen several times since its 2001selection, with the total cost of the mission rising more than 20 percent,topping?$550 million before the team asked?for an additional?$50?million in the spring of 2007.NASA?s associate administrator for science at the time, Alan Stern, directed the Keplerteam to find a way to deliver the mission without a new cash infusion or face cancellation. ?We were determined to get theprogram back on track. And that?s exactly what we did. It was a verydifficult period. There was a lot of pressure,? Troeltzsch said. The re-plan Stern set in motion was a?catalyzing event,? he said, causing a flurry of management changes at?Ball, Ames and elsewhere. ?We held to the Stern agreement ofno cost increase ? no more money, and that?s what we did,? Troeltzsch said. ?Stability is a large part of it ? of suppliers and funding. But you have tolive in the world you live in.? The Laboratory for Atmospheric andSpace Physics (LASP) at the University of Colorado here isunder contract to Ball Aerospace to operate Kepler. The?mission operations center will bestaffed by a mix of?students and professionals from?the university and technicians from nearbyBall Aerospace. ?Our job isto do on-orbit commanding,? said Bill Possel, director of mission operations anddata systems at LASP. LASP is currently flying four Earth-orbiting satellites,he said: the Aeronomy of Ice in the Mesosphere; the Solar Radiation and ClimateExperiment; the Ice, Cloud, and land Elevation Satellite (ICESat); and theQuick Scatterometer. In terms ofthe challenge presented by operating Kepler, Possel said it is ?maybe a notchabove? the level of complexity of ICESat. Possel saida compliment of eight to 10?students are presently consideredKepler-ready, in addition to a mix of professionals from theuniversity and Ball. Using LASP for?Kepler mission operations not onlysaves NASA money, he said, it also provides an invaluable,career-enhancing opportunity for students. ?We?re thefirst line of defense for the spacecraft, instrument health and safety,? Posseladded. ?It?s a win-win ? for the science team because it?s less expensive andthe aerospace industry wins because you get a trained engineer that hashands-on experience for the work force.? This alladds up to getting more science at lower cost, a LASP credo, Possel said. ?For thestudents, Kepler is so cool,? Possel said. ?To look for habitable-sized planets? and doing it as a student. The science is complex, but not complex enoughthat you can?t explain it to your parents.? The ongoing search for exo-planets is anexciting field, said James Fanson, Kepler project manager at NASA?s Jet PropulsionLaboratory in Pasadena, Calif.
?Keplerfits very timely into this growing field by giving us an opportunity for thefirst time to determine how frequently Earth-size planets form and orbit in ahabitable zone around other stars,? Fanson said. ?We?re focused on trying tofind Earth analogs. So we?ve designed Kepler specifically to detect planetsthat are the size of the Earth and even slightly smaller.? Kepler will serve as a spotterscope, Fanson said, finding candidate planets that can then be targeted byEarth-based observations to rule out false-positive detections. Of course,Kepler could come up dry in its hunt for Earth-sized planets circling distant stars. Conversely,there exists the prospect of discovering scads of Earth-sized planets, therebyadding more gusto to the belief that Earth is part of a rich tapestry ofhabitable worlds. ?Personally,the way I think about it is that we just have no data. We just don?t know theanswer,? Fanson said. ?We?re simply privileged to live at a time when we havethe technology and the science to actually answer that question finally forhumankind.? Borucki of NASA Ames said Kepler is a step forward, offering aspotter-scope capability that will support future decision-making?about building more powerfulspacecraft to home in on candidate worlds capable ofsustaining life. ?We need to know if this is a wildgoose chase or not,? Borucki added. ?We?re at a bifurcation point and Kepler isjust a step, one step in many steps as we explore the galaxy. ?